Collocations are recurrent, usage- rather than semantically based word combinations. The fact that they are largely language-specific - even with respect to languages as closely related as German and English - suggests the need for a bilingual collocation dictionary. This need is proven by analysing a representative selection of comprehensive present-day general bilingual dictionaries as well as by evaluating outputs from machine translation tools, both online and commercial. The doctoral thesis starts with an outline of the different concepts, methods, sources and applications as regards collocations in both the contemporary and historical perspectives. Next, collocations are discussed in the contrastive (English-German) light. Before embarking on the discussion of the methods I have tested with a view to compiling such an English-German adjective-noun dictionary, I outline the main principles of bilingual lexicography at large. 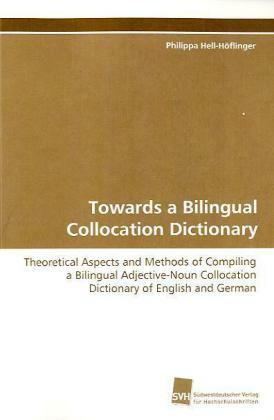 By way of conclusion, the applicability of such a dictionary is tested along with the hypothesis as to the expansion possibility of the adjective-noun dictionary to other collocational structures.